• Spindle accuracy guaranteed to be within 0.000050 T.I.R. Levin high-accuracy instrument lathe headstocks are now available as separate units for versatile inspection room applications. The collet seats in these units are guaranteed to run true within 0.000050 inch T.I.R. A major advantage of the concentricity inspection unit is its use of precision instrument lathe collets. The collet's small size and sensitivity enables it to hold subminiature parts where a larger collet might cause damage because of the relatively large closing force required. 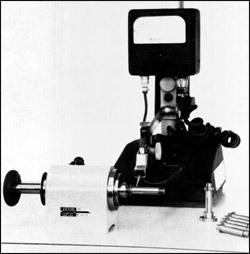 In addition, instrument lathe collets are far more accurate than larger lathe collets. Special step collets can be supplied which will grip larger diameter surfaces that are too large for a clear-through collet. Precision Levin collets are available in 0.05 mm increments from 0.1 to 1.0 mm and in 0.1 mm increments from 1.0 to 8.0 mm. Fractional size collets can be supplied from 1/64" to 5/16" in 1/64" increments. Upon special request, intermediate sizes can be furnished within 48 hours. For fast production checking, headstocks can be supplied mounted on a small bed and indicators can be mounted on a compound slide rest attached to the bed. An optional lever feed permits rapid checking of parts without having to continually move an indicator stand over a surface plate.